See how a robot controls a human's arm. Yes, not the other way around. See how a robot controls a human’s arm. Yes, not the other way around. Sensitive robotic arms capable of mimicking the precise movement and manipulation of a human’s hand have been used extensively in the past, especially in delicate research where normally human hands would be exposed to hazardous environments. But a robot controlling a human arm? That’s unheard of. A team of french researchers have developed a system through which a robot sends small bursts of electrical signals to electrodes taped to the person’s forearm and biceps. In the right succession, these control the subject’s elbow and arm to move in a certain manner. 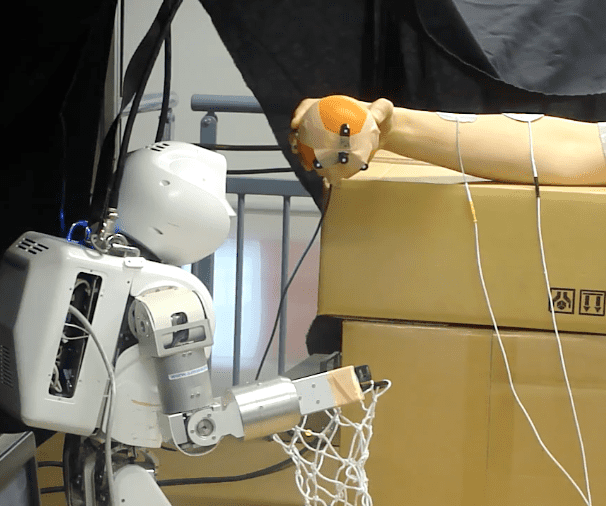 For instance, the researchers managed to program the robot to hold a hoop, while at the same time sending signals to a subject’s arm to coordinate it to move to the correct location and drop the ball. The technique employed is called functional electrical stimulation (FES), and is currently used in rehabilitation with real physical and psychological benefits to patients. A robot controlling a human’s body could greatly help a paralyzed limb recover. The scientists from Montpellier Laboratory of Informatics, Robotics, and Microelectronics, say that they’re still in the development phase, however more complex models will be developed in the future. Brain-interfaced robotic arms or even exoskeletons are currently offering paralyzed individuals the hope for living a normal life someday, and this current research looks promiscing enough to join them. Check out the video below which features the system in action. How do you find the prospect of a robot controlling human limbs? I know this will generate some controversy, but hopefully we can start off an interesting conversation.